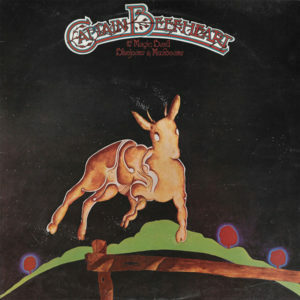 Captain Beefheart released two album in 1974 on the Mercury label in the US and the Virgin label in the UK: Unconditionally Guaranteed and Bluejeans & Moonbeams. They both ventured into MOR (mainstream oriented rock) territory. Most Beefheart fans are appalled by both of these albums. The problem is that Beefheart had released some of the most inventive and abstract rock ever recorded. His turn toward smoothed-over commercial pop-rock is not something music snobs ever accept. On the one hand, Unconditionally Guaranteed is pretty dull, save for bits of a few tracks (“Peaches,” etc.) with horn sections that seem like less energetic versions of material off 15-60-75‘s Jimmy Bell’s Still in Town (1976). A clear parallel to the album’s overall turn toward mediocre conventions is CAN’s Out of Reach (1978). Unconditionally Guaranteed was recorded by the same Magic Band lineup that had worked with Beefheart for many years. They all quit after finishing the album. So Bluejeans & Moonbeams was recorded with any entirely new backing band. Some fans give the new band the derogatory nickname “The Tragic Band”. But all this is a bit wrong. Bluejeans & Moonbeams is a pretty decent album. Sure, it bears no resemblance to Trout Mask Replica. But so what? If this had been released under a new band name rather than being credited to “Captain Beefheart and The Magic Band” it seems likely many who hate it would have an entirely different opinion. In other words, the problem here is one of expectations. While this is definitely not one of the Captain’s best, with an open mind this fits comfortably alongside bluesy MOR rock of the mid-70s. This is definitely not a bad album — the same cannot really be said for Unconditionally Guaranteed. If you expect new frontiers to be crossed you will be disappointed by this. But ask yourself first whether such expectations are appropriate.